Hot Deals & New Product Intro! Rescue Folding Knife " Yellow Handle w/ Black Coated Blde" "1 Only!" 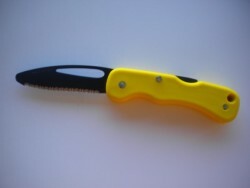 *Our folding rescue knife uses a fully serrated fron edge blade!